Sometimes all it takes is a little motivational poster to make things okay again. Well, it’s not really a poster, but I did make it in Word last night because, well, I needed to remind myself why I’m doing what I’m doing. I’ve always been creative. Always. Ever since I could remember I’ve had a vivid imagination and began writing stories at a young age. I remember I had to do one for a school project in elementary school (I think) and I told the story of how the sun came to be in the sky (crappy drawings included). I was proud of it then. I’m sure if I read it now, though, I’d be like, “What was I writing?” But for a young kid to write something like that, it’s pretty exciting. As I got a bit older and my friends introduced me to manga in sixth grade, that’s when the stories really started to flow (as well as my artistic abilities, too). I began writing at eleven or twelve years old a story that I based off of the manga series Tokyo Mew Mew by Reiko Yoshida and illustrated by Mia Ikumi. It was my first full length novel. Well, I never completed it, and it was in 14 size font, but it was in the old Word program from ages ago. BUT I do remember writing over 70 pages of story. I mean, that’s a lot for a twelve year old to write. I had this whole concept developed in my head, but it’s also one of those stories that’ll never see the light of day. From that time on my parents, especially my dad, have always urged me on to write. They know how creative and capable I am, and I’m not just saying that because they’re my parents. They’ve read some of my stuff and they’re impressed that it just all comes from my head, you know? Well, now that I’m out of college and doing these writing activities like NaNoWriMo and Camp, I realized how much I’ve missed writing. Yes, I’ve written short stories over the years for classes, and I want to continue doing that, but for a full length novel? That’s a challenge and a commitment. And I’ve taken that challenge. And I will. Even tough there will be dry spells and days where I just can’t get any words out lest I force the shittiest words ever to come out, I’ll write. 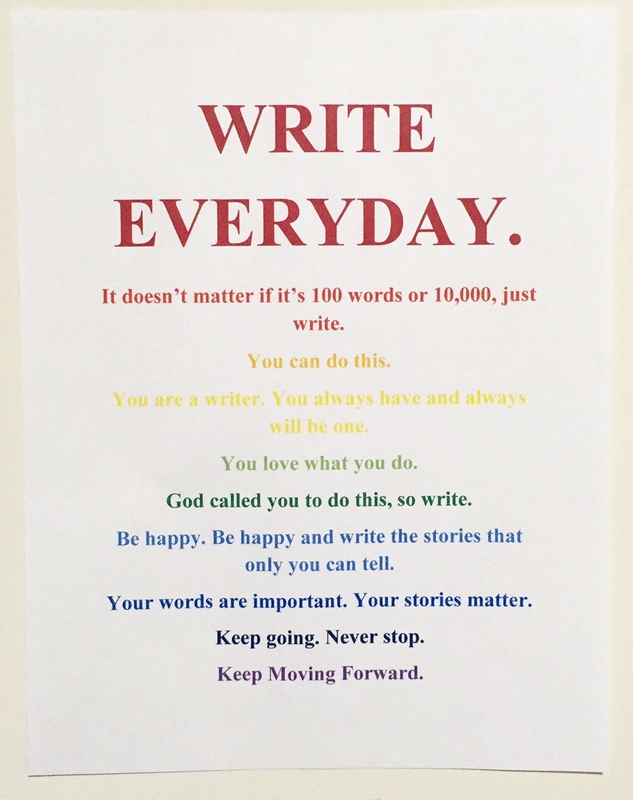 Write everyday. Keep going. Never stop. Keep moving forward. P.S. I am now over 35k words out of my 50k word goal for the month. My story won’t be near completion by then, and I’m happy about that, because it just shows how big this story is and how much it means to me. I found my groove. I hope you find yours. How’s your writing coming along? Have you come across bumps in the road or are you managing to avoid them? Let me know! This entry was posted in NaNoWriMo and tagged camp nanowrimo, finding that groove, inspiration, motivation, NaNoWriMo, National Novel Writing Month, progress, story, write, writing. Bookmark the permalink.